Celiac disease, or celiac sprue, officially known as “gluten intolerant enteropathy” is a genetic auto-immune disorder, this means that a gene carries a physical trait, and that trait can be passed down from one family member to another. “Auto-immune” describes the way that the disease does damage; “auto” means “to oneself” so it is saying that the immune system of a celiac mistakenly does damage to the celiac rather than to the supposed invader. What happens is that the immune system believes that a portion of the food eaten needs to be attacked, and as a side-effect of the attack, the lining of the small intestine gets damaged. It appears as though the gene for celiac disease may ride on the same gene as diabetes, and like diabetes, you can carry the gene but not have the disease. It takes some “triggering event” to start up the process (little is known about this mechanism, but suspected “events” include physical or emotional stress, pregnancy, over-exposure to wheat, other diseases, and even antibiotics); and, of course, the celiac must be exposed to wheat in the first place. Dermatitis herpetiformis (DH) is another form of celiac disease. Anyone who has DH is a celiac. In this form of the disease, lesions that look like a herpes sore appear on the skin, usually in very symmetrical ways: on the hands, arms, head, elbows, knees, buttocks, etc. They are often extremely itchy. (Please note that the name of this disease is misleading, it has absolutely nothing to do with herpes. A very common wheat allergy happens when your body sees wheat as an invader and attacks it. Symptoms of a wheat allergy could be eczema (different from dermatitis herpetiformis), sneezing, increased acne, or if you have a very serious allergy to wheat, you might have an anaphylactic reaction in which your throat can swell up to the point where you can no longer breath. However, these are not typical symptoms of celiac disease. The main effect of celiac disease is the damage that is done to the small intestine; if you have symptoms that are caused by damage to the small intestine (for example, flattened villi as seen in a biopsy, or any form of malnutrition that is caused by the damaged villi) then what you have is not a wheat allergy, but rather celiac disease. Traditionally, experts have seen very few people with a simple “wheat allergy”, and many more with celiac disease, so many experts predict that celiac disease is more common than wheat allergies. 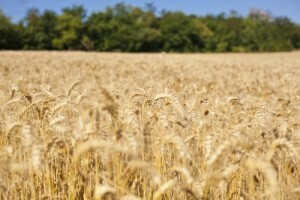 If you have problems with wheat, you should visit with a gastroenterologist and get tested for celiac disease. Unfortunately, at this time, there is no cure, and no hope for a cure any time soon. Once the disease has been triggered there is no way to turn it off, though in the far future there might be hope for gene therapies or other mechanisms which might work; none of these are likely in the near future. However, while there is no actual cure, a gluten-free diet solves most of the problems associated with the disease. “Gluten-free” is another slight misnomer, since it’s probable that “gluten” isn’t the problem, and it certainly isn’t the whole problem, however this term has come to represent the celiac diet and so we define what we eat, or what we don’t eat, by this term. A gluten-free diet just means strict avoidance of wheat, rye, barley and oats, even in the tiniest of amounts. This is more easily said than done, but once one becomes familiar with the diet it becomes routine. According to experts, celiac disease is known as “The Great Mimic” because patients who ultimately end up diagnosed with the disease come to the doctor’s office with such a wide variety of symptoms that it can be very hard to diagnose. What this means is that there is no typical set of symptoms. There is a classic set of symptoms (diarrhea, thinness, malnutrition, pot belly) that is associated with the disease, but classic is not the same as typical. People with celiac disease who are not following a gluten-free diet may have just one symptom (maybe just anemia, or feeling run down, or behavioral problems) or they may have several. That said, here is a list of possible symptoms which can include short term symptoms such as: diarrhea, constipation, steatorrhea (fatty stools that float rather than sink), abdominal pain, excessive gas, fuzzy-mindedness after gluten ingestion, burning sensations in the throat, irritability, inability to concentrate, pale, malodorous, bulky stools, frequent, foamy diarrhea, and an itchy rash (in dermatitis herpetiformis). Longer term symptoms can include: any problem associated with vitamin deficiencies such as; iron deficiency (anemia), chronic fatigue, weakness, weight loss, bone pain, easily fractured bones, abnormal or impaired skin sensation (paresthesia), including burning, prickling, itching or tingling, and edema, as well as, white flecks on the fingernails, failure to thrive (in infants and children), paleness, wasted buttocks, pot belly with or without painful bloating, and persistent itchy rashes (in dermatitis herpetiformis). Celiacs who are not following a gluten-free diet will suffer from damage to the lining of their small intestines (specifically, to the “villi” the little hair-like growth that helps process food in the small intestine). This damage slows and even prevents the digestion of food, which can lead to malnutrition (anemia, osteoporosis, vitamin deficiencies, and more). Over the long term, the constant damage to the small intestine can cause enough wear to lead to intestinal cancers. In the short run, many annoying symptoms can also make life downright uncomfortable. Following a gluten-free diet reduces the risk of cancer down to that of the general population, and will improve digestion enough to sustain the body normally, as well as getting rid of the usual short-term side effects. The primary indicator test for celiac disease involves three biopsies (one before going on a gluten-free diet, showing damage to the villi; one during a gluten-free diet, showing healed villi; one after going back to eating gluten, again showing damage), but many knowledgeable physicians now accept one biopsy, an antibody blood test, and improvement of symptoms while on a gluten-free diet (the biopsy showing damage to the villi prior to a gluten-free diet; the antibody test showing elevated antibodies to gluten while still eating a gluten-filled diet). A less formal diagnostic process would just involve the blood tests, and improvement on a gluten-free diet. It should be noted that the blood tests look for elevated IgA antibodies as an immune response to gluten, but a fair percentage of people with celiac disease are IgA deficient, and so their tests would give a false negative. There is another test now being manufactured (Tissue Transglutaminase Testing or tTG) which looks at IgG antibodies, instead of IgA antibodies, that is proving very reliable for diagnosing celiac disease. Although the disease itself has been around for quite some time, it gets the name “sprue” from the similarity of symptoms to “tropical sprue” which is an older known disease, the cause of the disease was not recognized until the middle of this century, when war-time limited supplies of wheat to local populations, and a physician noticed after the war, that several of his “sprue” patients who had improved during the war, were now ill again. It was not long before he realized that wheat was the culprit. Seriously….such a valuable web page. So insightful, look onward to coming back again. Thanks regarding delivering many of these very good knowledge. thnx for sharing this well put together web page. So insightful….looking forward to coming back. Thanks a ton for sharing your neat site. it has aided me out loads. I hope to give a contribution & help other customers like its helped me. Do you know any techniques to help reduce content from being stolen? I’d truly appreciate it. I enjoy the information on your websites. Thnx. Keep up the excellent job and bringing in|generating} the group!